Our situation is more dire than you may understand. AMC's new horror series The Terror puts a supernatural spin on one of the greatest martime mysteries of all time: the disappearance of the Franklin Expedition. In 1845, Arctic explorer Sir John Franklin, two ships, and 128 crew set out to chart the fabled Northwest Passage – a sea route to connect Europe and Asia – and vanished in the high Arctic, leaving only scattered records and bleached bones. 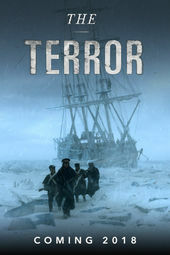 Adapted from Dan Simmons' novel of the same name, The Terror follows Franklin (Ciaran Hinds) and his men during the calamitous unknown years of the voyage, a period in which Inuit locals became the only witnesses to the disaster. According to this fictionalized account, the bitter cold is not the only thing to fear north of the Arctic circle. 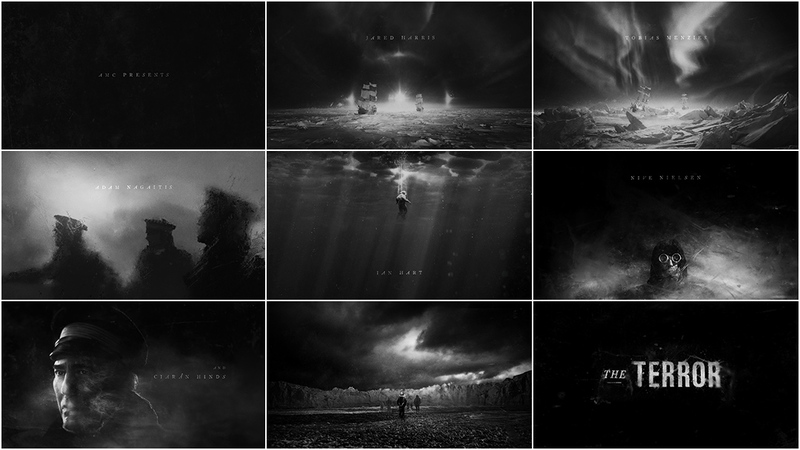 For the opening of The Terror, the showrunners and design studio Elastic hauntingly convey the story of this doomed expedition with a brisk, monochromatic main title sequence viewed through sheets of ice. As sun dogs turn to auroras, the ships – HMS Erebus and HMS Terror – are frozen in place, the crew bound in snow and darkness for the endless winter, driven to madness and worse. One by one the crew fades from view, those who remain setting off into a white wasteland and an unknown fate.